For divers and snorkelers in the warm, shallow waters of the Caribbean, Fire Coral is a well-known menace. Appearing to the untrained eye like a simple brown coral or green-yellow seaweed, Fire Coral is infamous for causing an incredibly painful burning sensation on contact with the skin on during just the slightest brush. 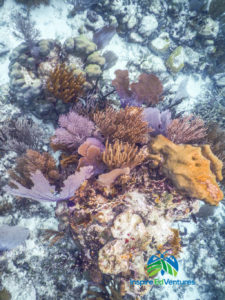 While not usually dangerous, for those looking to enjoy the waters of Belize, it’s worth keeping an eye out for – and staying well away from. Fire Coral, despite its name, is not actually a form of coral. Instead, it is a Hydrozoa, related closer to the Portuguese Man-o-War than traditional soft or stony corals. Like the Man-o-War, Fire Coral has a multi-step life cycle: beginning its life as a simple polyp, it later transforms into a free-flowing medusa capable of laying and fertilizing eggs at a later stage in its life. After these eggs hatch, they become floating planula, which upon landing on the seabed transform once again into polyps. The structure of a Fire Coral is formed by a massive colony of these polyps, which are surrounded by a hollow skeleton structure that protects the microscopic polyps themselves. Fire Coral feed on zooplankton and phytoplankton through tiny pores in the skeleton, which allow specialized polyps, called nematocysts (or stinging cells) to cover plankton in a snaring mucus before delivering the food into their mouths. These nematocysts also double as a form of protection, delivering that particular burning sensation on contact with the skin. Because Fire Coral – also known as Stinging or Red Sea Coral— is a polyp colony which can form into many separate shapes, it can be difficult to determine it simply by its structure, which can vary from thin, branched forms to large fan-shaped versions, making it easy to mistake for something more benign. Luckily, while the burning sensation is certainly uncomfortable, it is rare for it to be any more dangerous than simply painful. Taking care of the stings is relatively straightforward: washing the area (which looks like a welt or rash) with vinegar or isopropyl alcohol is effective at minimalizing the pain, or at the very least rising with salt water. Fresh water should be avoided, however, as it can often make the pain much worse. n the end, the best way to avoid these unwater menaces by wearing a dive or skin suit if in an area where they are known to be common – or better yet, to not touch them at all.